I have some more questions about this program. How can I get more information? How much does a premium plaque cost? The following are answers supplementary to the information found in the application package. I own an old building. Can I get a plaque for my building? Who can request a plaque for a Municipal Heritage Site? Only the owner of a Municipal Heritage Site in Brandon that does not have a plaque may request a plaque for that site. My Municipal Heritage Site is also designated as a Provincial Heritage Site and/or a National Historic Site. Can I still get a plaque for my Municipal Heritage Site? Yes, you may still request a plaque because your site is designated as a Municipal Heritage Site. If you do not already have a plaque for the other designations, contact the Manitoba Historic Resources Branch for Provincial Heritage Sites, or the Historic Sites and Monuments Board of Canada for National Historic Sites. I’m interested in getting a standard plaque for my Municipal Heritage Site. What do I do? Include current proof of ownership of your Municipal Heritage Site, such as a Status of Title, with your written request. If the owner is an organization, include verification that you are a signing authority of the organization. The Senior Planner will confirm the standard plaque request with the owner of the Municipal Heritage Site. After confirmation, the Senior Planner will deliver the plaque to the owner of the Municipal Heritage Site. The City of Brandon Planning, Property & Buildings Department will strive to deliver the plaque within two (2) weeks of the confirmation. The owner of the Municipal Heritage Site will mount the plaque on a wall on the site in a manner that the plaque is clearly visible from the street. I’m interested in getting a premium plaque for my Municipal Heritage Site. What do I do? Submit a written request and payment for a premium plaque. You can pay for the plaque by MasterCard, VISA, debit or cheque (payable to “City of Brandon”). The Senior Planner will confirm the premium plaque request with the owner of the Municipal Heritage Site. After confirmation, the Senior Planner will work with the owner of the Municipal Heritage Site on the text for the plaque. The Municipal Heritage Advisory Committee (MHAC) will review the draft text before the Senior Planner orders the plaque on behalf of the owner of the Municipal Heritage Site. Based on the current contract with our plaque manufacturer, the plaque should take thirty (30) days to produce and deliver to the City of Brandon Planning, Property & Buildings Department (PPB). If the invoice for the premium plaque is higher than the amount paid by the owner of the Municipal Heritage Site, the owner must pay the difference. If there are no outstanding costs about the premium plaque, the Heritage Community Planner will deliver the plaque to the owner of the Municipal Heritage Site. PPB will strive to deliver the plaque within two (2) weeks of the confirmation of no outstanding costs. If this is the first premium plaque for the Municipal Heritage Site, the Senior Planner will confirm if the owner wants a plaque unveiling ceremony. The owner of the Municipal Heritage Site will mount the plaque on a wall on the site in a manner that the plaque is clearly visible from the street. If the owner is eligible for and requested a plaque unveiling ceremony, the ceremony will occur after the plaque is mounted and at a date and time agreed by the owner and the Senior Planner or designate. The Senior Planner or designate will organize the ceremony on behalf of MHAC and coordinate with the owner. How do I mount the plaque? The plaques have lugs cast onto the backs. 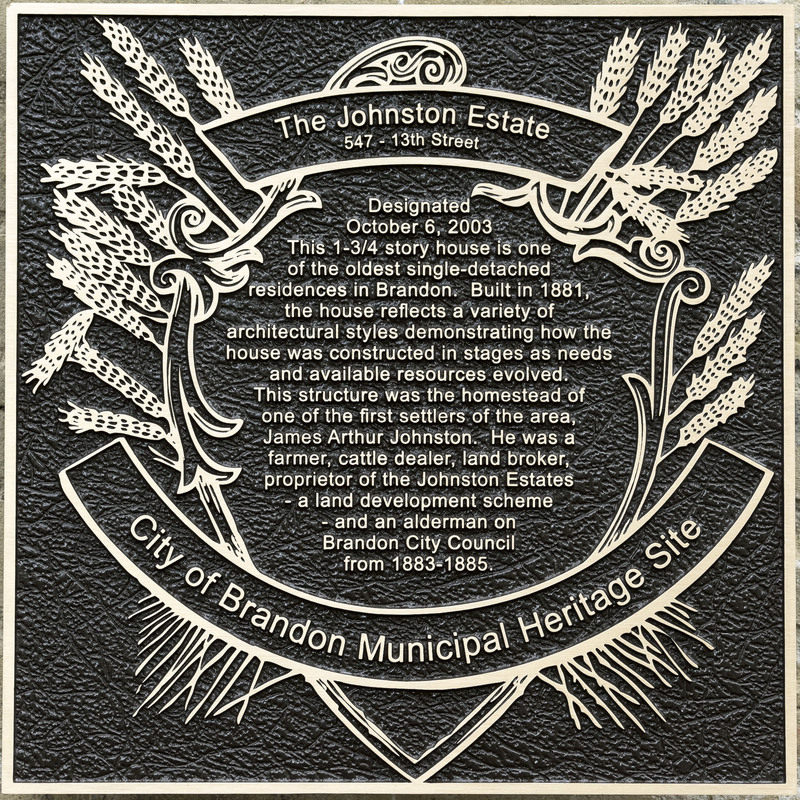 The City of Brandon Planning, Property & Buildings Department will provide threaded rods and mounting instructions recommended by the plaque manufacturer when we deliver the plaque to you. I had a plaque on my Municipal Heritage Site, but the plaque was stolen, damaged, or destroyed. What can I do? If you lost a standard plaque because it was stolen, damaged, or destroyed, and you are determined to be not at fault, you may, upon written request, receive a replacement standard plaque at no charge (see “I’m interested in getting a standard plaque for my Municipal Heritage Site. What do I do?” above for the procedure). The Senior Planner may need more information to verify the plaque is stolen, damaged, or destroyed, and the applicable circumstances. A replacement charge may apply if you are determined to be at fault for the loss of the plaque, or if this is not the first replacement plaque issued for the affected Municipal Heritage Site. Do I get to keep the plaque if I move out of my Municipal Heritage Site? The plaque must stay with the Municipal Heritage Site, even if there is a change in ownership of the site. My Municipal Heritage Site has been delisted (designation removed). What do I do with the plaque? Only Municipal Heritage Sites qualify to have a plaque. If City Council removes the Municipal Heritage Site designation from your property, you must return the plaque to the City of Brandon Planning, Property & Buildings Department.